Line a baking sheet with aluminum foil. Toss butternut squash with olive oil and salt and spread out onto prepared pan. Roast for 15-20 minutes until tender. While squash is roasting, prepare salad dressing. Using a salad dressing shaker, add all ingredients and shake well. If serving for a group, add mixed greens to a large bowl. 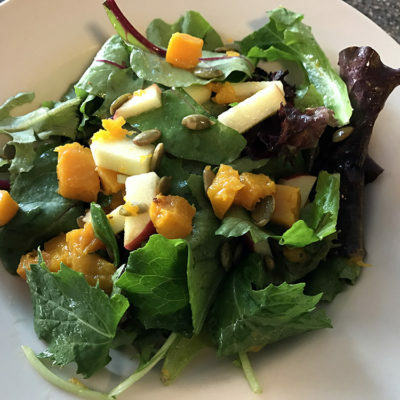 Top with roasted butternut squash, apples, pumpkin seeds and a drizzle of the dressing. Keep rest of dressing near salad to add extra.